Another fantastic story about losing 12 kgs in less than 4 months is here! Till mid this year, I weighed 83 kgs. My weight till 3 years back was always between 60-62 kgs and post my marriage and relocation to Bangalore, I put on 20 kgs in 2 and a half years. Tested for thyroid but it was negative. Despite several attempts, the weight just wouldn’t come down. Early this year, I was diagnosed with Avascular neucrosis wherein the blood circulation to my hip had stopped. I had to immediately undergo a core decompression surgery which helps restart the circulation. I was bed ridden for 2.5 months and post that I had to walk with the help of a crutch. It was during this time that I decided to lose weight as with my 83 kgs of weight my recovery would have been slow as my entire body weight would have come on my legs and hip. Once I decided, I got in touch with a personal dietitian and she helped me fix a routine keeping my medical condition in mind. Through her diet, I have managed to lose 12 kgs in 3 months and I currently weigh 71 kgs. My new diet has not just made me feel fitter but also made me realize the power of healthy eating. My junk eating habits are now substituted with healthier options. I eat regular meals but portions are defined. Dieting does not mean starving, it just means healthy eating. Initially I was skeptical that without any kind of physical activity, whether or not I will be able to lose weight but thanks to the motivation from my dietitian and my own self-determination, I have managed to lose weight all thanks to my changed eating habits. I feel more energetic than before and I’m just 6-7 kgs away from my ideal weight. I started my weight loss journey from June end and as of now, I have lost 12 kgs. I’m a PR publicist by profession working in Bangalore. Why did you decide to transform your body? I had been thinking about losing weight for quite some time but with my work schedule could never really get myself to a gym or work on a diet. But post my surgery when my physio explained to me how losing weight will help me in recovering faster, was when I decided that I should lose weight and in the next 23 days I had started off with my weight loss journey. How far have you reached on your weight loss journey? Well, I’m yet to reach my goal but I’m happy with my current achievement. My dietitian Garima understood my medical condition and the limitations and put me on a diet that was healthy and also balanced my intake of carbs, proteins, fiber etc. I think with constant motivation from Garima and my mother, and my own self determination, I was able to sustain myself in the weight loss journey. At times, it used to get really frustrating, but then Garima never let me lose hope. What dietary changes did you make? What was your typical diet in a day? Garima understood my daily food intake and helped me with a balanced diet. I eat small meals through out the day and healthier options of the food that I like. A typical diet in a day for me is having Jeera water empty stomach in the morning and then breakfast of either oats milk or oat chila or egg white toast. I have one fruit as my mid morning snack and then lunch is either sabzi, salad and raita or wheat bran roti with sabzi or moong dal chilla. In the evening I have green tea and dinner is either a bowl of soup or dal. I drinks loads of water through the day now which I earlier didn’t. How do you feel now about your self? I feel good about myself, I feel more energetic and confident. I had reached a point wherein I had started believing that I wont be able to lose weight but once I began to lose kgs and inches, it made me further more determined to keep at it. I’m still few kilos away to reach my ideal weight and I know that I will be able to do it. Trust me the joy of fitting into clothes that you had thought you will never be able to fit in ever gives you a different kind of high!! 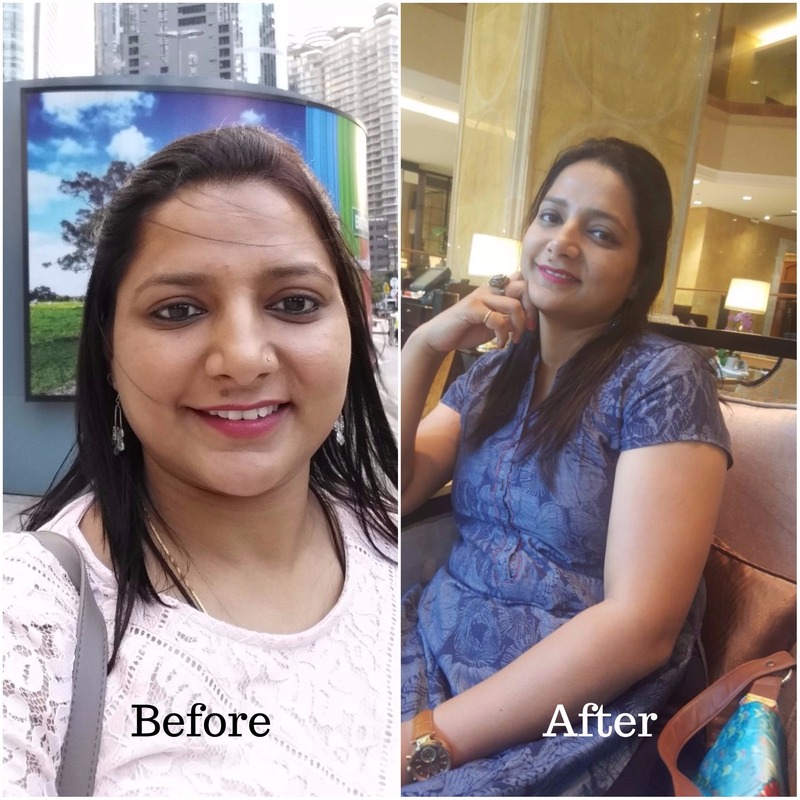 If Neha’s story inspired you, click here to read more such spectacular weight loss stories!